Craft: The first image is the original, then I imported it into Photoshop and used layers to complete the middle (finished) product. 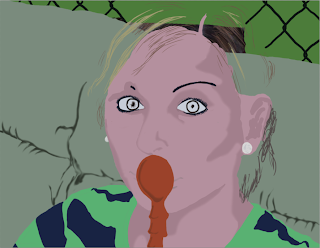 I started in the back of the image, using the background green to make the first layer all green. After this I added another layer on top of that to create the fence, which was drawn with a Bamboo pen and pad tool that was connected to the computer. The next layer was to complete the bench on witch the individual was sitting on. I used the rectangle marquee tool to fill in most of the blacks and then came in with the pen and pad tool again to fill in what was left. This project consists of the pen and pad that is attached to the computer to be able to use my hand to draw in what I needed such as individual strands of hair, and eye lashes. To make the shading and darker areas more crisp I used the blending tool to smudge the colors a bit, and then went in with an eraser tool and made it the softest possible to erase some of the edges of the blended areas. Concept: The concept of this image was to take a picture of and individual from a family get together and turn a photo of them into a illustration. I took this picture of my cousin Kelsey because she is in such a silly pose that it just seemed like the best idea for the photo. She is always doing silly things like this so I felt that it was the perfect idea/photo to complete this project. 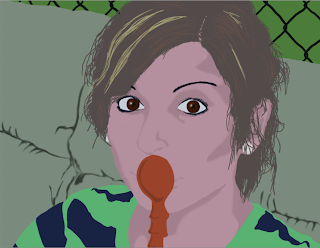 The final image is placed on this blog for just a reason to show what the image will look like if one of the layers were removed. In this case the image turned out to look a little creepy, and if my cousin is bald, or possibly a zombie! Composition: This illustration is composed of a series of layers working from the background to the foreground. It is created from a photo of my cousin who is sitting on a bench in my Aunt's backyard for a family get together. In this image you can see the background grass behind the fence, then we see the bench and finally her. It is composed to make the viewer focus on two major things; 1. Her eyes that dominate the images, and 2. 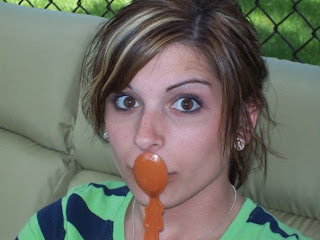 The orange spoon that belongs to a younger family member.